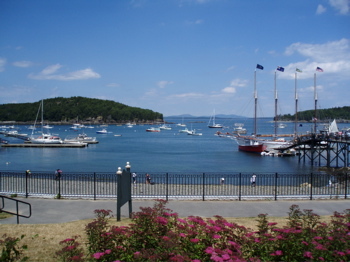 Blue Skies, Red Lobsters, Strawberries & Goats – Maine. Ocean. Camping. 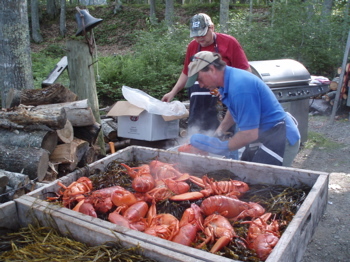 Saturday July 5 was the first lobsterbake of the season. While some family members were a bit nervous about how everything would go I somehow knew that it would be good. Fresh air, fresh local ingredients, everyone in low stress, high vacation mode, what could go wrong. Perhaps my years of working at the Boston Pops and knowing true chaos gave me an underlying confidence. But it should come as no news that the lobsterbake turned out to be a big hit. All the foods were cooked perfectly and served hot. The lobsters and mussels were flavorful, the corn fresh, the bread (my responsibility) turned out yummy, and the homemade strawberry shortcake was outstanding. I kept serving more mussels and steamers, the baskets somehow never emptying. The folks chowed down and everyone had a good time. As result of all the good weather, produce has been growing. Everything here is organic, lettuce keeps coming, heirloom beans, peas, garlic carrots, onions, parsley and oregano are used nearly everyday in meals. 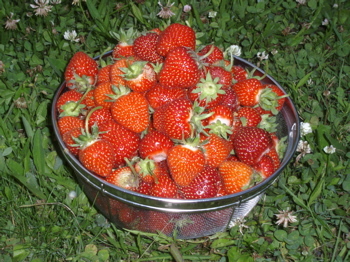 But the biggest and best are the strawberries. The first day I’m here we pick them and they could look any better. I mean they are beyond anything photoshop could ever produce. And they taste just amazing. Red, ripe and juicy, we have shortcake desserts, daiquiris, and with morning cereals. I will definitely miss the berries when I leave. The Goats are the newest addition to the camp. The grey one is named Neeshee and the white one is Lollie (or Queen Lollie). They sometimes bleat at night or early morning. The camp kids seem to take to the goats, herding them around, feeding them and making them feel special. 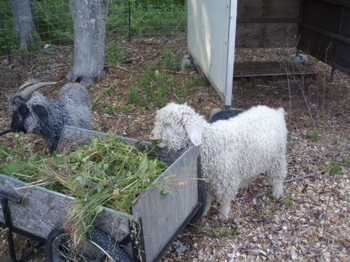 They eat nearly anything green and seem to be constantly grazing. I’ve yet to see any goat milk or cheese but perhaps that’s in the works for later on.